Rationale: Patients hospitalized with chronic obstructive pulmonary disease (COPD) who require supplemental oxygen (O2) are at increased risk of hospital readmissions. There is a paucity of information regarding quality of evaluation and documentation regarding the need for supplemental O2 in this population. Objective: To determine the extent to which evaluation and documentation regarding the need for supplemental O2 occurs prior to hospital discharge in patients with COPD. Methods: We conducted a two-center retrospective cohort study of hospitalized adults with a physician diagnosis of COPD. We reviewed electronic health records to ascertain whether patients underwent evaluation beyond rest oximetry documenting hypoxemia and if there was adequate documentation of supplemental O2 requirements prior to discharge. Results: Of 526 patients hospitalized with a primary or secondary discharge diagnosis of COPD, 335 patients (mean age 69 years, 78% with diagnosis of COPD exacerbation) met eligibility criteria. Overall, 1 in 5 (22%, 73/335) hospitalized patients with COPD had an evaluation beyond rest oximetry for supplemental O2 requirements during admission. Adequate documentation of supplemental O2 requirements occurred in even fewer patients (16%, 54/335). Both evaluation (26% versus 5%, p=0.002) and documentation (19% versus 4%, p=0.001) of supplemental O2 requirements were more common in patients hospitalized for a COPD exacerbation compared to those hospitalized with COPD but without an exacerbation. 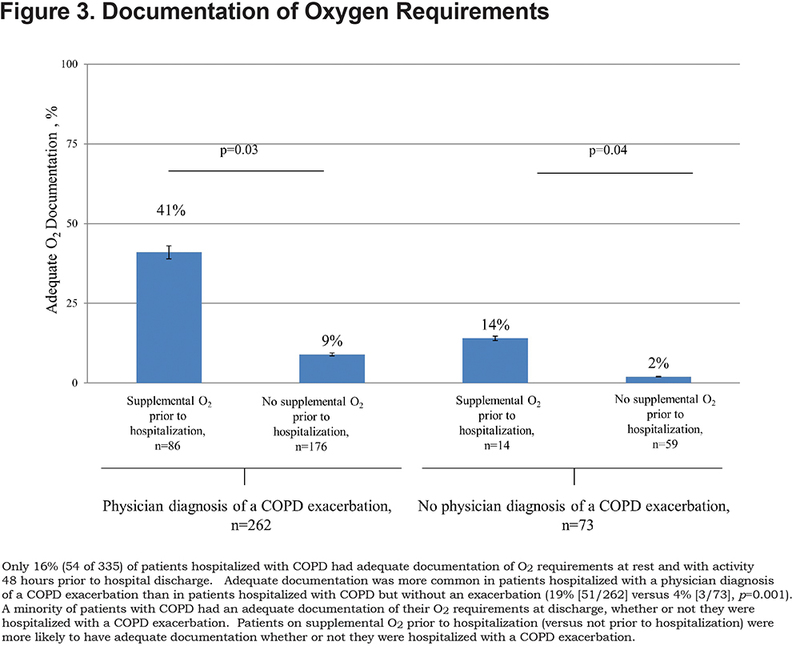 Conclusions: Evaluation and documentation of supplemental O2 requirements beyond rest oximetry occur infrequently in patients hospitalized with COPD. Funding support: Dr. Zaidi is supported by a National Institutes of Health institutional training grant (T32 HL082547). Despite the importance of documentation to support a clinical indication for supplemental O2 in patients hospitalized with COPD, there is a surprising paucity of published information about the quality of evaluation and documentation regarding the need for supplemental O2 in this population. Addressing this information gap could help to inform the need for hospital-based quality improvement programs devoted to oxygen prescriptions prior to hospital discharge as an additional strategy to enhance patient safety and to reduce avoidable readmissions in patients with COPD. Therefore, the objective of the Documentation and evaluation of Oxygen Requirements In COPD (DORIC) study was to determine the extent to which evaluation and documentation regarding the need for supplemental O2 occurred prior to hospital discharge in patients with COPD. 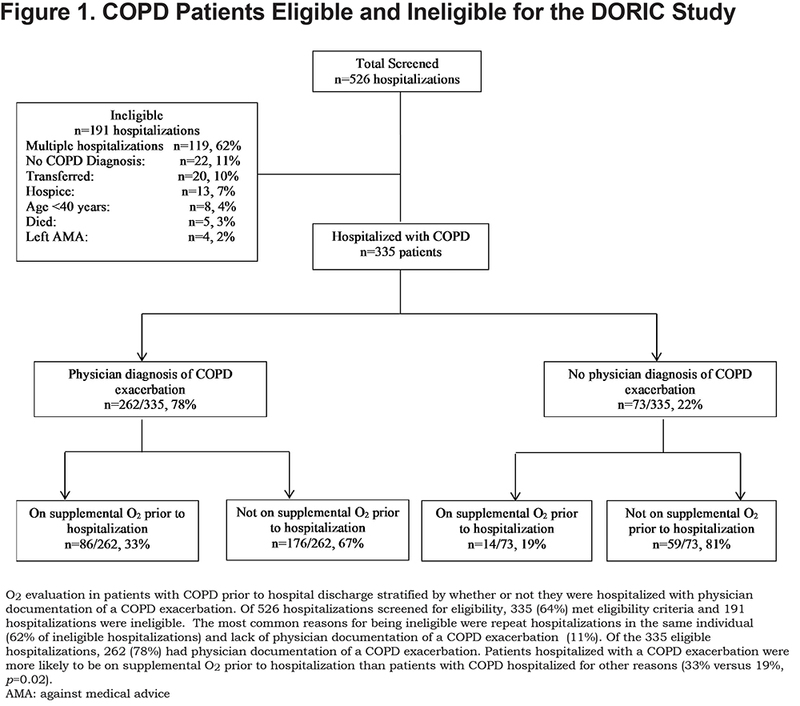 Secondary objectives of the DORIC study were to examine the extent to which evaluation and documentation occurred prior to discharge in patients hospitalized with COPD with and without an exacerbation, as well as in those prescribed and not prescribed supplemental O2 at home prior to the index hospitalization. We conducted a retrospective cohort study of adults at 2 academic health care centers in Chicago, Illinois (a university-affiliated hospital and a Veterans Affairs medical center). The study received a waiver for the requirement of informed consent and institutional review board approval was obtained at both institutions (#2015-0572; #833934-1). The electronic health records (EHRs) for hospitalizations that met screening criteria were reviewed by 2 clinicians (FZ or RSL) to identify hospitalizations with a physician documentation of COPD in the discharge summary (emphysema, chronic obstructive pulmonary disease, or COPD). Hospitalization records were deemed ineligible if: (1) the patient had a previous hospitalization during the study period (only the first hospitalization was eligible); or (2) the patient was transferred to another hospital, discharged to hospice, left against medical advice, or died prior to hospital discharge. We defined an increase in O2 requirement as: (1) a new requirement in patients who were not on supplemental O2 prior to the index hospitalization; or (2) an increase in the flow of O2 at rest or with exercise. A decrease in O2 requirement was defined as: (1) no requirement in patients who were on supplemental O2 prior to the index hospitalization; or (2) a decrease in the flow of O2 at rest or with exercise. For patients who were identified as needing supplemental O2, we reviewed the discharge summary and written instructions provided to patients at the time of the hospital discharge. Adequate documentation was defined as documentation of all the following information: the O2 flow at rest and with activity, and the type of O2 delivery device (e.g., nasal cannula).14 For example, “home O2 by nasal cannula, 2L/min at rest and 3L/min with exercise” was considered adequate documentation. “On home O2 as needed” was considered inadequate documentation. Review of data extracted from the EHR in the first 50 hospitalizations failed to identify a single instance of documentation of supplemental O2 requirements during sleep, so we did not include such documentation in the definition of “adequate documentation”. Therefore, our results could be considered a “liberal” definition of adequate documentation. Of 526 hospitalizations, 335 met eligibility criteria (Figure 1). Patients were mostly men and African American (Table 1). 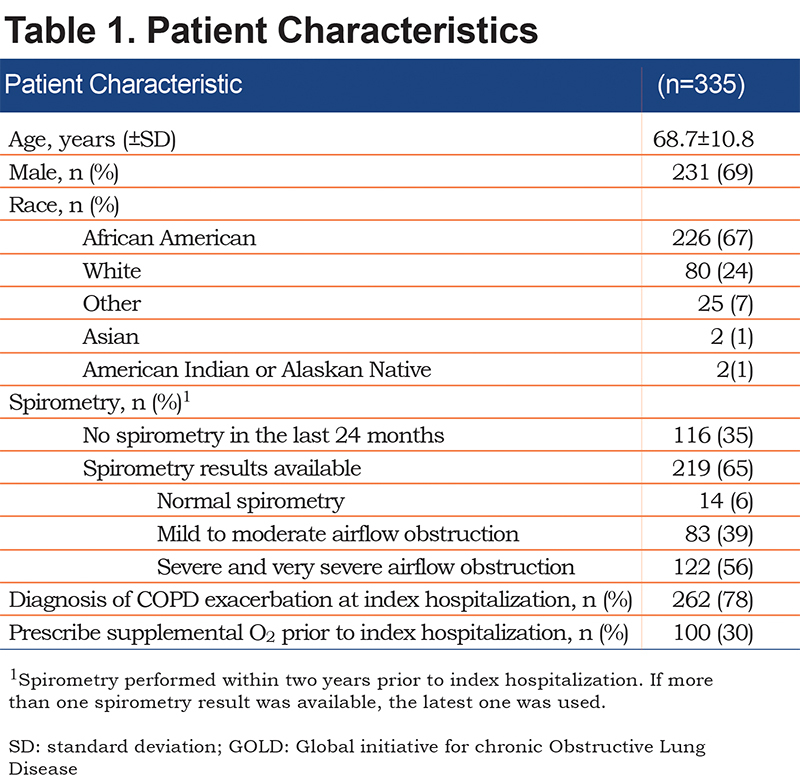 Two-thirds of patients (65%) had documentation of post-bronchodilator spirometry in the EHR, and within this group, about half had severe or very severe airflow obstruction. The majority (78%) of patients had a physician documentation of a COPD exacerbation. Supplemental O2 use prior to hospital admission was nearly twice as likely in patients hospitalized with a COPD exacerbation versus patients hospitalized with COPD without an exacerbation (33% versus 19%, p=0.02). Overall, about 1 in 5 (22%, 73/335) patients hospitalized with COPD underwent an adequate evaluation for supplemental O2 requirement. Results were similar in the 2 hospitals that were included in the study (23% versus 21% of patients had an evaluation, p=0.58). 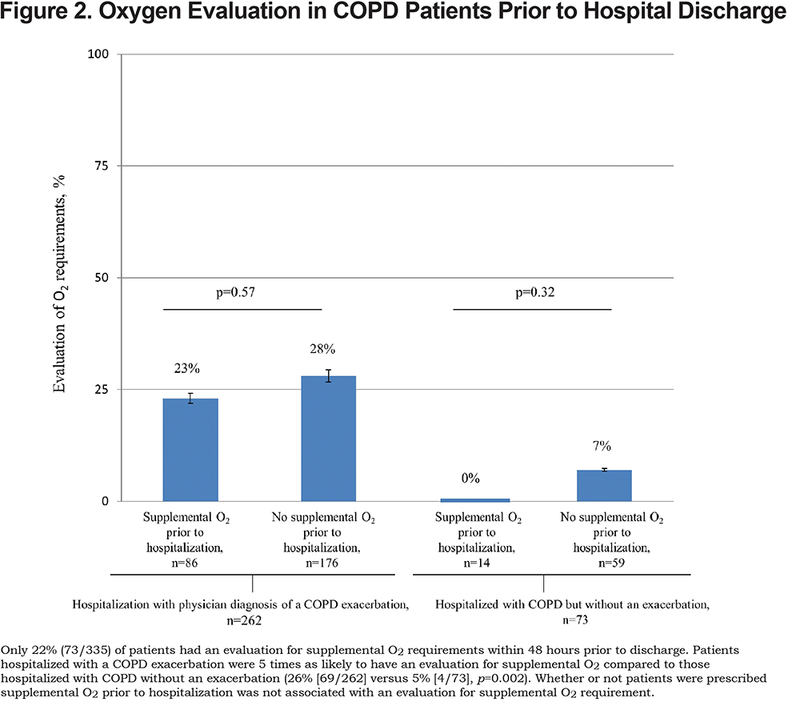 Patients hospitalized with a COPD exacerbation were 5 times as likely to have an adequate evaluation for supplemental O2 compared to those hospitalized with COPD but without an exacerbation (26% [69/262] versus 5% [4/73], p=0.002). However, an adequate evaluation for supplemental O2 requirements was not associated with whether or not patients were prescribed supplemental O2 prior to hospitalization (Figure 2). In the subgroup of 20 patients hospitalized with a COPD exacerbation, prescribed supplemental O2 prior to hospitalization, and who underwent a re-evaluation of their O2 requirement, a roughly equal number of patients had an increase (5/20, 25%), decrease (8/20, 40%), or no change (7/20, 35%) in O2 requirements. In the subgroup of 49 patients hospitalized with a COPD exacerbation, who were not prescribed supplemental O2 prior to hospitalization, and who underwent an evaluation of their O2 requirement, 20/49 (41%) were found to have a new O2 requirement. Thus, in the 69 patients hospitalized with a COPD exacerbation and who underwent an evaluation for supplemental O2 requirements, 33 (48%) had either an increase, decrease, or new O2 requirement. Adequate documentation of supplemental O2 requirements at rest and with exertion, occurred in fewer than a fifth (16%, 54/335) of all hospitalized patients with COPD and was 5 times as likely in patients hospitalized with a physician diagnosis of COPD exacerbation compared to those without an exacerbation (19% versus 4%, respectively, p=0.001). Adequate documentation for supplemental O2 requirements was more likely in patients who were on versus not on supplemental O2 prior to hospitalization (patients with a COPD exacerbation: p=0.03; patients without a COPD exacerbation: p=0.04; Figure 3). In this two-center study of 335 patients hospitalized with COPD, the majority had gaps in the evaluation and documentation of oxygen prescriptions prior to discharge. Only 1 in 5 underwent an evaluation and fewer than 1 in 5 had adequate documentation of supplemental O2 requirements at rest and with activity prior to hospital discharge. Compared to patients hospitalized with COPD but without an exacerbation, patients hospitalized with a COPD exacerbation were 5 times as likely to have an adequate evaluation and 5 times as likely to have adequate documentation of supplemental O2 requirements prior to hospital discharge. Being prescribed supplemental O2 at home prior to the index hospitalization was not associated with a re-evaluation of supplemental O2 requirements, but was associated with an increased likelihood of having adequate documentation prior to discharge. There is increasing interest in medication reconciliation at times of transitions in care, such as during a discharge from the hospital to home.24 In this context, medication reconciliation refers to processes to avoid inadvertent omissions, duplications, or incorrect doses of medications by reviewing the patient’s medication regimen (e.g., using self-report, prescription refills) with instructions provided to patients at the time of hospital discharge.25 A systematic review of clinical trials found that medication reconciliation reduced discrepancies, with a decrease in actual and potential adverse drug events.26 Anecdotal experience suggests that some clinicians include O2 prescriptions as part of the medication reconciliation process, however this practice is not universal and is not specifically recommended by the Agency for Healthcare Research and Quality’s Medications at Transitions and Clinical Handoffs' Toolkit for Medication Reconciliation.27 CMS does not reimburse O2 as a medication but rather as durable medical equipment.14 This could explain why appropriate documentation of O2 prescriptions is not included in hospital-based efforts to develop and implement medication reconciliation processes. This DORIC study has a number of strengths. First, our study addresses an important aspect of care in patients with COPD – the use of supplemental O2 – one of very few treatments that has been demonstrated to increase survival.9,10 Second, we included over 300 patients and observed similarly low performance at 2 institutions, suggesting that our findings may not be an isolated problem in the quality of COPD care. Our study also has some important limitations. We assessed information in the EHR, and it is possible that evaluation and documentation of care was recorded elsewhere (e.g., notes by clinicians on paper forms submitted to durable medical equipment companies). Such information is required by durable medical equipment companies when requesting initiation of supplemental oxygen, but not when patients were previously on supplemental oxygen. In the 2 study hospitals, the EHR did not contain a scanned copy of forms submitted to durable medical equipment companies or other such documentation. It is our view that the EHR should contain information relevant to the care of patients, so that post-acute care clinicians, patients, and their caregivers have the information they need to provide appropriate care. Also, our study focused on 2 hospitals and it is not known if results are generalizable to other settings. Additional studies involving different regions, urban/rural settings, for profit versus not for profit hospitals, teaching versus nonteaching hospitals, hospital versus ambulatory settings are needed to compare performance across various care settings. We also did not assess the barriers and facilitators of evaluation and documentation of supplemental O2 requirements; additional studies devoted to this question are needed, as well as studies to identify best practices for improving the quality of care regarding the evaluation and documentation of supplemental O2 requirements. In conclusion, our study suggests that adequate evaluation and documentation of supplemental O2 requirements is rarely performed in patients hospitalized with COPD. Further research is required to determine if our findings generalize to other settings and to assess the effectiveness of strategies that promote an evaluation and documentation of supplemental O2 requirements at rest and with activity prior to hospital discharge on patient safety, including avoidable readmissions. The authors thank all study patients and the staff of the Breathe Chicago Center® at the University of Illinois at Chicago for their assistance in conducting this study. Author contributions: All authors had access to the data and take responsibility for the integrity of the data and the accuracy of the data analysis. F.Z. contributed to the study conception, hypothesis delineation, data analysis and interpretation, writing and revision of the manuscript. J.A.K. contributed to the study conception, hypothesis delineation, data acquisition, analysis and interpretation, writing and revision of the manuscript. R.S. L., V.P.C., and B.A.B. contributed to the acquisition and interpretation of the data and revision of the manuscript. A.T, H.A.J, N.E.B., and M.J. contributed to the interpretation, writing, and revision of the manuscript. The views expressed in this article are those of the authors and do not necessarily reflect the position or policy of the Department of Veterans Affairs, the U.S. government, or the National Institutes of Health. None of the authors have any real or apparent conflicts of interest including financial and consulting relationships. 1. Global Initiative for Chronic Obstructive Lung Disease (GOLD). GOLD website. http://goldcopd.org/global-strategy-diagnosis-management-prevention-copd-2016/ Published 2016. Accessed October 24, 2016. 2. Centers for Disease Control and Prevention. Chronic obstructive pulmonary disease among adults — United States, 2011. MMWR Morb Mortal Wkly Rep. 2012; 61(46): 938-943. 3. Mini-o AM, Murphy SL, Xu JQ, Kochanek KD. Deaths: Final data for 2008. Nat Vital Stat Rep. 2011.59(10): 1-127. 4. Xu J, Murphy Sl, Kockanek MS, Bastian B. Deaths: Final data for 2013. Nat Vital Stat Rep. 2016; 64(2):1-119. 5. National Heart, Lung, and Blood Institute (NHLBI). 2012 NHLBI Morbidity and Mortality Chart Book. http://www.nhlbi.nih.gov/research/reports/2012-mortality-chart-book Published February 2012. Updated May 2013. Accessed October 24, 2016. 6. Sjoding MW, Cooke CR. Readmission penalties for chronic obstructive pulmonary disease will further stress hospitals caring for vulnerable patient populations. Am J Resp Crit Care Med. 2014; 190(90):1072-1074. 8. U.S. Congress, House Committee on Ways and Means, Committee on Energy and Commerce, Committee on Education and Labor. Compilation of Patient Protection and Affordable Care Act: As amended through 1 November 2010, including Patient Protection and Affordable Care Act health-related portions of the Health Care and Education Reconciliation Act of 2010. U.S. House of Representatives website. http://housedocs.house.gov/energycommerce/ppacacon.pdf Published 2010. Accessed October 2016. 10. Long term domiciliary oxygen therapy in chronic hypoxic cor pulmonale complicating chronic bronchitis and emphysema. Report of the Medical Research Council Working Party. Lancet. 1981; 1:681-686. 14. Centers for Medicaid and Medicare (CMS). Home oxygen therapy. CMS website. https://www.cms.gov/Outreach-and-Education/Medicare-Learning-Network-MLN/MLNProducts/Downloads/Home-Oxygen-Therapy-Text-Only.pdf Published October 2016. Accessed October 24, 2016. 24. Agency for Healthcare Research and Quality/ Patient Safety Network. Patient Safety Primer: Medication reconciliation. Patient Safety Network website. https://psnet.ahrq.gov/primers/primer/1/medication-reconciliation Accessed October 24, 2016. 27. Agency for Healthcare Research and Quality. Medications at transitions and clinical handoffs (MATCH) toolkit for medications reconciliation, Chapter 3: Developing change: Designing the medication reconciliation process. http://www.ahrq.gov/professionals/quality-patient-safety/patient-safety-resources/resources/match/match3.html Published August 2012. Accessed October 24, 2016.